Our equine therapy horses in Haysville, KS bring a noticeable personality and experience to the practice. For each horse, they offer people specialized abilities to help everyone overcome obstacles and heal at the same time. Big Bubba loves hugs ALMOST as much as he loves treats. Truly a gentle giant, he loves children and is very patient with a huge heart to match his size. Big Bubba loves water, standing in his water buckets, being sprayed by the hose, and swimming in the lake. Justice has lived at Blue Sky Ranch since he was less than a year old. His very best friend is Big Bubba. Justice is full of energy and can be quite the scaredy cat, but he mostly uses his energy to love on people. 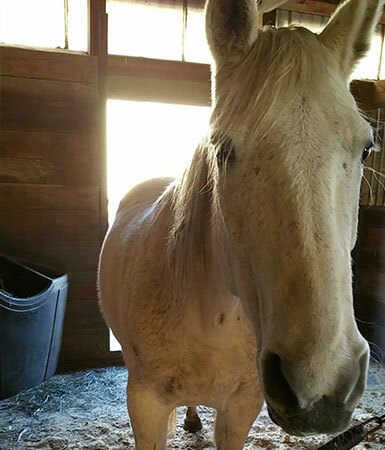 Quita is a mother to everyone – horses, cats, and especially people. Quita is very sensitive and quick to react to situations. We are convinced she knows how people are feeling even before they do! She loves attention, and if you rub her back – she will probably try to rub yours, too! Dash lives up to his name. He is very fast – especially if food is involved. Dash does not bond quickly with people but when he does…it is a forever friendship! Dash loves trail rides and laying in the lake on hot summer days. Blessing is our smallest horse. She is also very gentle. Blessings pasture mates seem like giants to her, but they always love her. She loves to trot next to people, and her very favorite clients are children. Blessing is very comfortable with a child hanging on her tail, walking under her, and hugging on her legs. You will hear no complaints from this Grandma! Binks is our overcomer! Just his presence alone offers hope to anyone that finds themselves in the midst of a challenge. Being a prey animal, a horse’s eyesight is extremely important. When Binks lost his eye due to illness, he clearly decided that he would not be kept down. He is a survivor! Binks learned to adjust to his new environment and circumstances. He thrives in life because he chose to. Horse sponsorship is an amazing way to support the daily needs of our mission. A contribution of $1500 covers the annual cost for one horse’s vet, feed, and farrier. Choose your favorite horse to sponsor and your name will be placed on the stall door and on this web page for one year! Please remember that all donations to Blue Sky Ranch are 100% tax deductible. Our horses are looking forward to your support!